From a practical viewpoint, IIoT components and subsystems are built at different times, by different teams, and in different places. In order to interoperate, they need to be able to communicate meaningfully. In order to communicate, the underlying connectivity infrastructure must facilitate the exchange of information between the participants. 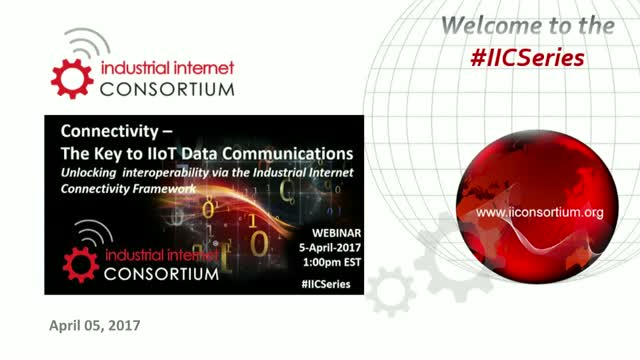 The Industrial Internet Connectivity Framework (IICF) is a comprehensive resource for understanding Industrial Internet of Things (IIoT) connectivity considerations. Developed by international connectivity experts, the IICF defines the minimum expectations required to build next generation IIoT systems with syntactic interoperability between components and subsystems. Dr. Rajive Joshi, Principal Solution Architect, Real-time Innovations Inc. Presented by: Dr. Rajive Joshi, Principal Solution Architect, Real-time Innovations Inc.